Households face annual carbon tax bills of at least €3,000 unless the Government introduces a raft of measures to reduce emissions and tackle climate change. The stark tax bill figure – which could rise to as much as €4,559 – comes just a week after Taoiseach Leo Varadkar pledged to cut taxes worth €3,000 to the average worker if Fine Gael is re-elected to Government. The Economic and Social Research Institute (ESRI) has outlined how the carbon tax will have to increase from €20 per tonne today to between €300 by 2024 and €470 by 2030 if Ireland is to meet its legally binding reduction targets and avoid massive fines. If imposed, the changes will result in hefty increases in home heating bills and motoring costs. The average emissions per household from energy use stands at 9.7 million tonnes. When the tax is levied at €20 per tonne, the total paid by households is €194. However, if this tax rate is increased to €300, it will total €2,910 – and if it is hiked to €470, the total comes to €4,559. Meanwhile, Finance Minister Paschal Donohoe has been forced into a U-turn over changes to tax breaks which would hit thousands of ordinary workers. The Irish Independent reported yesterday how the Revenue Commissioners moved to strip teachers, CIÉ workers, hotel, bar and construction staff of their annual tax allowances. The flat rate scheme is meant to cover the costs of workers who have to pay for uniforms and tools. Mr Donohoe has confirmed that a review of tax relief on expenses will be carried out by the Revenue Commissioners next year. But he said there would be no attempt to stop the entitlements availed of by at least 80,000 workers until 2020. Irish carbon emissions are among the highest in the EU. Most energy use in an average Irish home is for heating, followed by water heating, the Sustainable Energy Authority of Ireland (SEAI) recently found. The ESRI suggests that unless a raft of ambitious policies including retrofitted properties, electrifying the transport fleet, achieving mass-scale energy efficiencies and phasing out of fossil fuel use takes place, the hikes will be needed for Ireland to avoid being hit with fines. Ireland is required to reduce carbon emissions by 20pc over 2005 levels by 2020 to comply with EU rules. It is not expected to reach this target, and the European Commission will likely impose fines or force the State to buy permits to compensate at cost of millions of euro. More onerous targets are in place for 2030, with a 30pc drop required. The new ESRI analysis, using the 'Ireland, Environment, Energy and Economy Model' (I3E) suggests that without new policies, dramatic carbon hikes will be required to avoid fines. Its analysis is based on four scenarios - the first has the carbon tax remaining at the current level of €20 per tonne. In this scenario, both 2020 and 2030 targets are missed. Using a second scenario where the carbon tax would rise to €30 next year, and €5 per year after, it also found the targets were missed. Even a third, more stringent, carbon tax proposed by the Environmental Pillar group - which called for a €70 tax next year, rising by €5 a year - saw the targets being missed. "We look at what tax would we need to reach the target," ESRI research officer Kelly de Bruin said. The analysis suggested that if agriculture reduced emissions at the same rate as the rest of the economy, the carbon tax will have to increase from €20 at present to just under €50 by 2020 and €300 by 2030. This would result in the average household paying €2,910 a year in carbon taxes in 2030, up from less than €200 at present. If agriculture did not play a role, the tax would need to increase to around €150 by 2020 and €470 by 2030 if the State is to hit its targets. This would increase bills to almost €4,600. "When you consider it in relation to the existing carbon tax, it is just jaw-dropping," she said. "It's safe to say the €20 carbon tax isn't going to cut it," but she added she did not expect the higher levels to be imposed. Last weekend, Taoiseach Leo Varadkar outlined how he wanted to introduce a tax cut worth €3,000 to the average worker if Fine Gael is returned to Government. 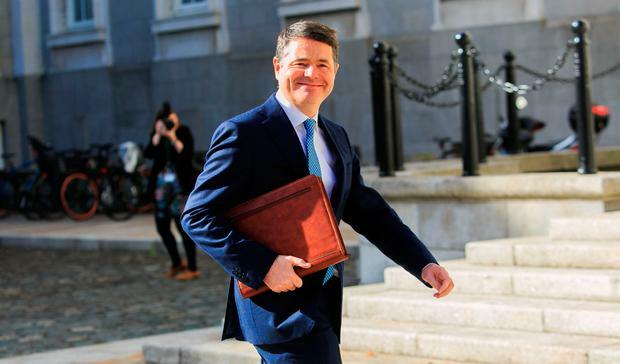 Finance Minister Paschal Donohoe has also insisted that Ireland will struggle to remain competitive in a post-Brexit era without major reductions in income tax. He said the "acceleration of where we have been over the last two budgets" would help more than 900,000 workers.